Total Controls on your figure tips. Volume adjustment by pic controls . Higher accuracy with higher speed due to servo control continuous motion. Provision of half and full stoppering. Inbuilt Scrambler & Unscr ally or fully stopper filled vials. Vial filling machine shall be equipped with eject collect tray for un stopper Vials. Provision for inert gas purging – pre and post the filling. Vial filling machine shall perform the following functions. Nitrogen purging (pre and post fill). ambler with rejected vial collect facility. 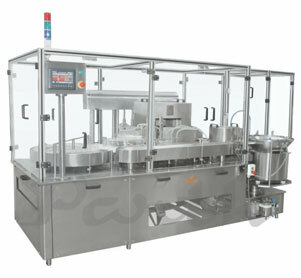 Vial filling machine shall be equipped with pumps with an accuracy of 0.5 on the fill volume.